In this “carefully researched, compellingly written game-changer for children’s health” (Mark Hyman, MD), Maya Shetreat-Klein, MD, reveals the shocking contents of children’s food, how it’s seriously harming their bodies and brains, and what you can do about it. And she presents a nutritional plan for getting and keeping children healthy—that any family can follow. Chronic diseases in children are rising dramatically—from allergies and ADHD to mental illnesses and obesity. A traditionally trained pediatric neurologist and a parent herself, Dr. Maya encountered the limits of conventional medicine when her son suffered a severe episode of asthma on his first birthday and hit a developmental plateau. Treatments failed to reverse his condition, so Dr. Maya embarked on a scientific investigation, discovering that food was at the root of her son’s illness, affecting his digestive system, immune system, and brain. The solution was shockingly simple: Heal the food, heal the gut, heal the brain…and heal the child. Recent changes in growing and processing food harm kids’ gut microbiomes, immune systems, and brains, contributing to chronic disease. Dr. Maya “convincingly argues the case for a dirt-filled but chemical-free life” (Publishers Weekly). She used fresh foods and nature to heal not only her son but chronically ill patients from around the world from the inside out and the outside in—and now makes it available in The Dirt Cure. 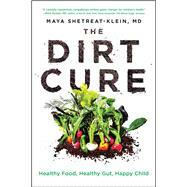 “Full of scientific information presented in a fun and informative way, [with] concrete evidence that good food can transform one’s life,” (Publishers Weekly), The Dirt Cure shares success stories from Dr. Maya’s practice and her tips as a working mother of three on stocking healing foods (from veggies to chocolate! ), reading labels, and getting even picky eaters into the new menu. “Reader-friendly” (Kirkus Reviews), this paradigm-shifting “tour de force prescription…to fight and prevent chronic disease” (Robert K. Naviaux, MD, PhD) empowers you to transform your child’s health through food and ensure the long-term wellbeing of your kids and the entire family.